Addressing employee misconduct is uncomfortable at the best of times, but with the right tools and an action plan, it is possible to turn the situation around. Take control of employee discipline with the Progressive Discipline Smart App. This Web-based app will serve as your guide to building a consistent documentation process that enables you to have smarter, more constructive conversations with all employees. 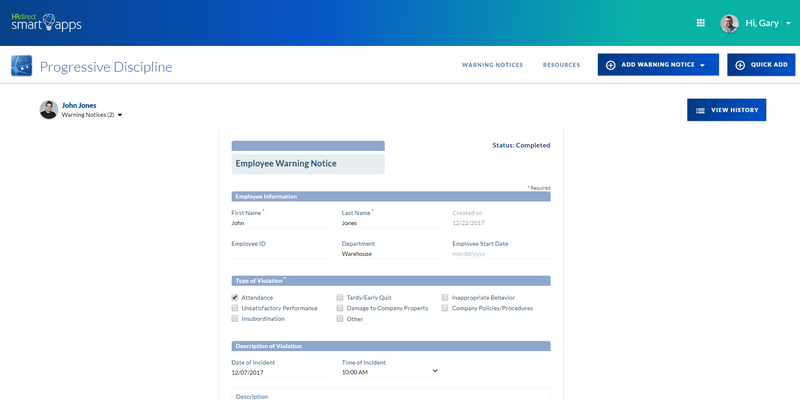 Just click on the employee you want to issue a disciplinary warning for. If you're already using other Smart Apps, there's no additional setup required. If you're new to Smart Apps, adding employees takes just a few minutes. Track all relevant details of the warning like date, time, type of violation, and describe the incident. Choose what point in the process of discipline this warning is: Warning, Probation, Suspension, or Termination. Then, document consequences should the incident occur again. This process automatically documents the progression of disciplinary actions per employee in a single, convenient view. It's critical that you have a conversation about the issue with the employee and a witness. Then, sign off when the discussion occurred. There's even space for notes about the discussion. Take the focus off of the person and onto the problem with an objective, regulated approach designed to support your company's highest objectives. When you’re better prepared for a difficult discussion, you’ll be more comfortable and so will your employees. Once you’ve worked through the Employee Warning Notice form, print it out and use it as your guide during the discussion for a more productive, constructive experience so you both can understand each other better and increase the likelihood of improvement. Document disciplinary or performance issues, follow-up actions, employee statement and possible consequences with a consistent process that helps ensure fair treatment for all employees. If termination is necessary, this documentation is crucial should legal disputes arise proving you discussed the issue with the employee multiple times and gave them ample opportunity to improve. Discipline is a rare case in employee management where it's not best to keep it strictly confidential. An employee may refuse to sign a warning notice or deny it later anyway. That's why the legal and compliance experts at ComplyRight recommend meeting with the employee and a witness. The Employee Warning Notice leaves space to document the witness's name. Then in a legal dispute, the witness can confirm in your defense that proper disciplinary communication occurred. Ready to Get Started with the Progressive Discipline Smart App?